I hate how scripts format on here. Anyways, hope this works. Will post another script tomorrow. His name is Randy, and he is taking a test on graphing quadratics in vertex form. 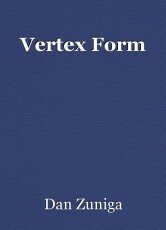 A vertex is the highest or lowest point on a graph. The vertex form can tell us that point on the graph. Not all quadratics start in vertex form. Take this, for example. Are you paying attention, Mister Loage? Good, then solve the following for me. Alright… so I am gonna write out the base equation (writes down y=a(x-h)^2+k) Now I gotta remember, the H equals the x-coordinate of the vertex, and the K equals the Y coordinate of the vertex. And since it is minus H in the base equation, if in the problem it is plus H, the x is negative. Now to start the problem, I see that H is plus 2, so that means the x-coordinate of the vertex is -2. Now for the y-coordinate, the K is plus 3, so that means the y-coordinate is 3, time to plot it. (Plots vertex on graph) Good, now to plot the rest of the graph like it is x^2, since there is no amplifier to the equation. (Graphs rest of equation) Perfect. Hmm… a little bit tougher, but no biggie. So first thing to do is the same thing as before, that 3 in the front doesn’t affect the vertex, so I see that the H is -1, so that means x=1. And then I see that K is -2, which means y=-2. (Plots vertex on graph) Alright, now I just gotta graph the rest like it is 3x^2 from the vertex. (Graphs the equation like so) Ah excellent… another one done. (Wiping away forehead tears) Alright, onto the next one. HEY! Eyes on your own paper! So, like, okay. I’m feeling where ya at? I don’t remember Vasquez teaching me this… but I guess I gotta try… (Readies pencil) So it says I gotta convert to vertex form and graph, so let's start by converting this. First thing I gotta do is move the 15 to the outside by completing the square, so what I do is I take B, which is 8, divide it by 2 and square it, which equals 16. So now below this I write (x^2+8x+16)+15, now I have the 15 on the outside. Next, I have to subtract 16 which I got from completing the square from 15 (writes -16 next to 15). Now all I have to do is factor the equation in parentheses and combine like terms and I’ll be good! I know that the function in parentheses is (x+4)^2 so I can turn it into that, then 15-16 equals -1, so our final equation is y=(x+4)^2-1! Now time to graph… I see that the vertex is (-4,-1) since H is -4 and K is -1. And now we plot the rest like it is x^2 since there is no amplifier! Um, this one. The last question. I...I don’t know if I can do this! Come on, Randy. I believe that you can. But it’s not enough for me to do that. You need to believe in yourself. Randy, we gotta finish this movie. Make it happen! This problem is… -3x^2-6x-1… oh boy. So just like the previous problem, I need to get the -1 out, and in addition, I need to take out the -3. First things first let’s get rid of the -1 in order to begin complete the square so now it will look like this (-3x^2-6x)-1. Now I gotta get rid of that -3, so what I am going to do is factor it out like this, and now the function looks like -3(x^2+2x)-1. Now to complete the square, I must take B again, divide it by 2, and square it, and since B is 2, the completed square is 1, so now the function looks like this -3(x^2+2+1)-1. Also like in the previous problem, I have to subtract the completed square by the outside value, but since there is a -3 on the outside, I have to multiply the subtracted value by -3, so now the function is -3(x^2+2x+1)-1-1(-3). When the value is multiplied it becomes positive 3 and when added to -1 it becomes positive 2. Then all I do is factor the equation in the parentheses and I’m done! This function factored is (x+1)^2, so that means the final function in vertex form is y=-3(x+1)^2+2. So now that I have it in vertex form I can graph (Graphs equation). Randy runs out, then jumps in the air like the end of Rocky (ur the best around) as music plays, and time stands still.